Please refer to our stock # 3508 when inquiring. 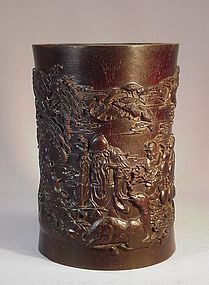 This carved ZiTan (紫 檀) hard wood Bitong (brush holder) is an early 20th century product. ZiTan is a species of Pterocarpus native to India. Chinese love the quality and hardness of the wood; therefore, they use it to make expensive items. The brush holder is 6 1/8” high and 4 1/4” in diameter. Carved in deep relief, it depicts Nan Ji Xian Weng (南 極 仙 翁) or Shou Xing, Shou Lao. The immortal stands under a tall pine tree, his loyal companion in the form of a male deer lies in front of him. A young girl and boy carrying a bunch of peaches are nearby. There are two cranes flying faraway surrounded by lucky clouds. There is a four line Chinese poem on the other side. "Lotus leaves provide safe haven to turtles, When in blossom, the WuTong tree attracts the phoenix to roost. Great sages will live long lasting life, Their luck and fortune are as high as the sky." Aside from two age crack lines, it is in great condition.